An important national issue in the United States is the degradation of water quality from nonpoint sources of pollution, including the prevalent use of fertilizers and pesticides on agricultural land. The issue is of interest to many residents, water resource managers, and policymakers across the nation because of the possible impacts on water uses, such as drinking, irrigation , recreation, and sustaining aquatic life. In sufficient quantities, nutrients from fertilizers encourage abundant growth of algae , which leads to low oxygen in streams and the possibility of fish kills. Pesticides and nitrate are a potential concern for human health if they affect a drinking-water source or occur where there is recreational use. Elevated concentrations of nitrate have been associated with methemoglobinemia , or "blue baby syndrome" in infants, and stomach disorders, and some pesticides have been associated with the potential for causing cancer. For the protection of drinking water and aquatic life, the U.S. Environmental Protection Agency (EPA), along with the states, have established water-quality standards and criteria for some pesticides and nitrate. These provide widely used benchmarks that serve as starting points for evaluating potential effects of exposure to these chemicals. Nationwide sampling of nitrogen, phosphorus, and more than eighty pesticides by the U.S. Geological Survey (USGS) from 1992 to 1996 indicated that streams and groundwater in agricultural basins almost always contain complex mixtures of nutrients and pesticides. Concentrations of nitrogen and phosphorus in streams commonly exceeded levels that can contribute to excessive plant growth. Average annual concentrations of phosphorus in three-fourths of seventy-five streams sampled in agricultural areas were greater than the desired EPA goal for preventing nuisance plant growth in streams. Nitrate was most prevalent in shallow groundwater (less than 30.5 meters (100 feet) below land surface) beneath agricultural areas, where about 15 percent of samples collected from 36 different agricultural areas exceeded the EPA drinking-water standard for nitrate. 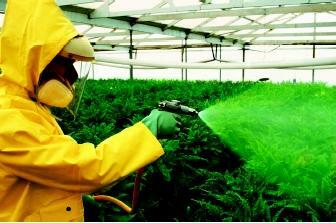 Pesticides applied in plant nurseries and greenhouses are less visible forms of agricultural chemicals than those applied to fields and orchards. But any form of chemical application can potentially contaminate water sources if not managed properly. frequently detected pesticide compounds in streams and shallow groundwater in agricultural areas were the major herbicides atrazine (and its transformation product desethylatrazine, or DEA), metolachlor, cyanazine, and alachlor, which ranked in the top five in national herbicide use for agriculture. Transformation products of metolachlor, alachlor, and cyanazine would probably also have been frequently detected if they had been analyzed. Compared to herbicides, currently used insecticides were less frequently found in agricultural streams, and even less in groundwater underlying agricultural areas. This results from their relatively low application rates and rapid breakdown in the environment. In contrast, historically used insecticides still persist in agricultural streams because of their resistance to breakdown in the environment. Dichlorodiphenyltrichloroethane, commonly known as DDT, was the most commonly detected organochlorine compound, followed by dieldrin and chlordane. DDT and aldrin (which breaks down rapidly to dieldrin in the environment) were two of the top three insecticides used for agriculture in the 1960s. Because of negative impacts on birds and other species, their uses were restricted in the 1970s; and yet, more than 20 years later, one or more sediment-quality guidelines were exceeded at 15 percent of sampled agricultural sites, and concentrations in whole fish exceeded wildlife guidelines at 20 percent of sampled sites. Most samples with a detectable pesticide contained mixtures of compounds. Nearly half of stream samples collected in agricultural areas contained five or more pesticides compounds, and about 15 percent contained more than ten compounds. Nearly one-third of shallow groundwater samples within agricultural areas had two or more pesticides. Atrazine, DEA, and metolachlor were the most commonly detected compounds in mixtures found in agricultural areas. Pesticide concentrations in streams (as annual averages, upon which drinking-water criteria are based) were generally low, only exceeding the EPA maximum contaminant level for atrazine in one location. Similarly, pesticide concentrations seldom exceeded the drinking water criteria in wells. Less than one-half of one percent of the sampled shallow wells in agricultural areas had concentrations greater than a criterion (one well for atrazine, one for cyanazine, two for dieldrin, and one for dinoseb). Analysis of geographic patterns in pesticide use revealed that concentrations of herbicides and insecticides in agricultural streams were highest in those areas of the nation with the greatest agricultural use. Herbicide concentrations were greatest in central U.S. streams, where use is most extensive. The direct relationship between chemical use and chemical concentrations in nearby surface water was demonstrated in some upper Midwest streams in 1994. After a new herbicide, acetochlor, partially replaced alachlor, nearby streams quickly showed increased acetochlor concentrations and decreased alachlor concentrations. For example, in the White River of Indiana, acetochlor was commonly detected, reaching a peak concentration of 2 parts per billion. Water contamination in agricultural areas is not, however, determined solely by chemical use. Natural features— topography , geology, soil type, hydrology , and climate—and land-management practices—tile drainage and irrigation and conservation strategies—make some areas more vulnerable to contamination than others. For example, some of the highest concentrations of nutrients and pesticides were in sand and gravel aquifers or in karst formations consisting of carbonate rocks with large fractures, voids, or conduits. These natural geologic features readily transmit water and are common in various parts of the United States. In contrast, groundwater contaminants underlying farmland in parts of the upper Midwest were barely detectable, despite similar high rates of chemical use. This is partly because the groundwater is somewhat shielded from surface infiltration of chemicals by relatively impermeable and poorly drained soils and glacial till that cover much of the region. In addition, tile drains and ditches commonly provide quick pathways for chemical transport to streams, which minimize the downward movement of contaminants to groundwater. The USGS findings not only documented geographic patterns, but seasonal patterns as well. In streams that drain agricultural areas throughout most of the nation, the highest levels of nutrients and pesticides occurred during spring and summer when recently applied chemicals are washed away by spring rains, snowmelt, and irrigation. In some parts of the country, other patterns were found, such as those in the San Joaquin-Tulare Basins in California where elevated concentrations of the insecticide diazinon occurred in the winter because of the use of pesticide sprays on the region's dormant orchards. Impact to Drinking Water and Aquatic Life. Hooded sprayers are among the improvements to chemical application methods. In this photograph, the hoods are directing herbicide just to the areas between rows of grain sorghum. many of the same issues, but existing water quality criteria were also more often exceeded. For example, the criteria for atrazine was exceeded in nearly 40 percent of sampled agricultural streams. Agricultural chemicals in water must be assessed not only in terms of scientific findings, but also in the broader context of U.S. agricultural development, a growing conservation ethic, and economics. In the past, farmers focussed primarily on production from their fields, often with little regard to the watershed in which the fields are located. Agricultural chemicals were seen only as scientific marvels; they killed the weeds which reduced crop growth and eliminated the insects that otherwise would have significantly reduced the quality of their crops. The potential impact on the environment, or for that matter, human health, simply was not on the average farmer's mind. Wearing protective clothing while mixing or applying pesticides was unheard of, and concern about runoff to streams or infiltration to groundwater was not considered. Concern about the potential harm from agricultural chemicals began slowly in the late 1950s and early 1960s and has been growing in both the public and the agricultural community since. Today, farmers are increasingly aware of the complex interrelationships between agricultural practices and environmental quality. Modern farmers now consider the timing of agricultural chemical application and irrigation, the amount and style of pesticide application, specific crop needs, and local weather conditions in their pesticide and fertilizer use. In some areas, it was common practice for farmers to apply a heavy load of fertilizer in the fall, reasoning that it would "be ready when the plants needed it in the spring," but not realizing that most of the fertilizer would leach from the soil before the plants began to grow. It was also common to broadcast pesticides by area-wide spraying, covering the ground where the targeted plants were located, as well as ground where they were not. But today's farmer, with the help of agricultural research, applies fertilizer and pesticide directly on the crop row, reducing the chemical needed and reducing the potential for leaching or runoff. Applying chemicals in a manner so that they do not leach below the root zone before the plant can utilize them is the key to both crop production and environmental protection. Farmers often check the weather conditions in the morning to adjust the droplet size in the sprayer based on forecasted wind and humidity. 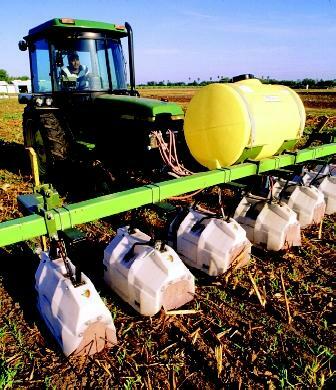 It is not uncommon for today's farmer to make use of satellite and GPS (global positioning system) technology to tailor the application of fertilizer and pesticide to the specific crop needs within a single field. Careful consideration of crop needs and the best method to deliver an agricultural chemical to its target has often led to a decrease in chemicals applied per acre, a decrease in the cost to the farmer, and less of a risk to the environment. SEE ALSO Agriculture and Water ; Algal Blooms in Fresh Water ; Carson, Rachel ; Chemicals: Combined Effect on Public Health ; Chemicals from Consumers ; Chemicals from Pharmaceuticals and Personal Care Products ; Clean Water Act ; Groundwater ; Irrigation Management ; Land Use and Water Quality ; Nutrients in Lakes and Streams ; Pollution of Groundwater ; Pollution Sources: Point and Nonpoint ; Safe Drinking Water Act ; Septic System Impacts . Gilliom, Robert J. et al. "Testing Water Quality for Pesticide Pollution." Environmental Science and Technology (April 1, 1999):164–169. Goss, D. W., and R. D. Wauchope. "The SCS/ARS/CES Pesticide Properties Database: Using It with Soils Data in a Screening Procedure." In Pesticides in the Next Decade: The Challenges Ahead, ed. D. I. Weigman. Blacksburg, VA: Virginia Water Resources Research Center (1990):471–493. Kolpin, Dana W., Earl M. Thurman, and S. M. Linhar. "The Environmental Occurrence of Herbicides: The Importance of Degradates in Groundwater." Arch. Environ. Contam. Toxicol. 35 (1998):385–390. Meyer, Michael T., and Earl M. Thurman, eds. "Herbicide Metabolites in Surface Water and Groundwater." ACS Symposium Series 630, American Chemical Society, Washington, D.C., 1996. U.S. Geological Survey. "Quality of Our Nation's Water—Nutrients and Pesticides." U.S. Geological Survey Circular 1225, 1999. High levels of chemical contamination are not just an agricultural problem. A U.S. Geological Survey study found that insecticides—most commonly diazinon, carbaryl, malathion, and chlorpyrifos—occurred more frequently and usually at higher concentrations in urban streams than in streams in agricultural areas. About two-thirds of urban streams sampled in the study had concentrations of insecticides that exceeded at least one guideline established to protect aquatic life. In addition, concentrations of total phosphorus generally were as high in urban streams as in agricultural streams, commonly exceeding the desired federal goal to control excessive plant and algae growth. As in agricultural areas, the types and concentrations of chemicals found in urban streams are closely linked to the chemicals used, such as on lawns, gardens, and in public areas. Reducing the amount of chemicals used and applying these chemicals more efficiently are two effective ways to reduce contaminant levels in both urban and agricultural settings. pesticides don't usaully kill the bugs we're aiming for so why don't we make stronger pesticides. If we make them to strong won't they get into the soil. we know that they make them so they won't but some time they will kill all the corn or beans.